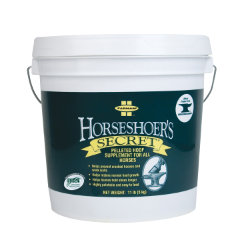 Developed to provide optimum nutrition for strong healthy hooves. Contains only the purest and most digestible ingredients, including biotin, lysine, methionine, fat, fiber, calcium, phosphorus, copper, zinc, and protein. Nutrients work together to help prevent cracked hooves and strengthen hoof walls. Helps to support normal hoof growth.